« What is the effect of Inspiration on JVP and blood pressure ? 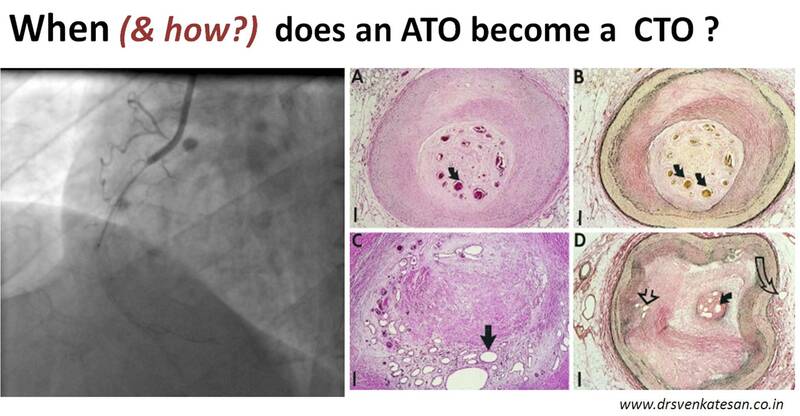 When does an ATO become a CTO following a STEMI ? STEMI occurs due to acute occlusion of a coronary artery (ATO) which needs emergency opening at the earliest, ideally within 3 hours , or up to 12h . The opening shall be either by pharmacological / catheter means or both. After 24 hours opening a ATO has questionable benefit unless the patient is hemodynamically unstable or symptomatic. What is a CTO ? Traditionally we believe 3 months is the period to call a coronary occlusion as chronic. (Previously it was 6 months) This time frame was considered appropriate based on our understanding of the infarct process , that may take up to 3 -6months for complete healing of infarct .This 3 month period is arbitrary as the chronology of intra-coronary lesion organisation is different from myocardial infarct healing. Its worthwhile to note the chronicity of a coronary lesion and its morphology is nothing to do with the quantum of myocardial damage it inflicts .This is because in many patients with STEMI who present late , the ATO progresses to CTO silently without any clinical demarcation or progressive myocardial damage. If 24 h is the cut off point for opening the ATOs to accrue any meaningful benefit , can we call all ATO’s beyond 24 h as physiological CTO equivalents ?It doesn’t make sense isn’t ? But , consider this , how do you call an occluded coronary artery between 24 h t0 say 2 weeks or 2 weeks to to 3 months ? Sub acute total occlusion (STO) ? .Some experts have argued to remove CTO as an entity from acute coronary setting .This can’t be done as chronicity has to set in for ACS lesion as well. Obviously , we have a nomenclature issue here. We require a new terminology to differentiate CTO related to ACS and CTO related to chronic coronary syndromes. The moment we diagnose a true chronic total occlusion , not only the urgency of intervention but also the indication to open becomes questionable in an otherwise asymptomatic population. An ironical situation often arises , when we can’t technically open a ATO in a one week old STEMI .However , the same lesion one may open after 3 months as it has acquired a new name by now as CTO , which is perceived a lesser guilty act of violating the sacred PCI guidelines !